North Korean leader Kim Jong-un has won an Indonesian statesmanship prize for "fighting neo-colonialism." The Sukarno Award, named for the late Indonesian dictator, has previously been awarded to Mahatma Gandhi, Aung San Suu Kyi and Kim's own grandfather Kim Il-sung. Sukarno and the elder Kim were partners in the nonaligned movement of the Cold War. Kim Jong-un was chosen because he is believed to be "consistent in carrying out the ideals" of his grandfather "which is to fight imperialism," the Sukarno Center said. The Jakarta Globe commented, "It is unclear how Kim Jong-un, whose saber-rattling and bellicose policies have exacerbated already strained and frosty ties with South Korea, Japan and the United States, has contributed in any way to world peace." Kim has recently made headlines for carrying out brutal purges in the upper echelons of the military and failing to solve his country's exacerbating food crisis, but he has also introduced timid economic reforms. 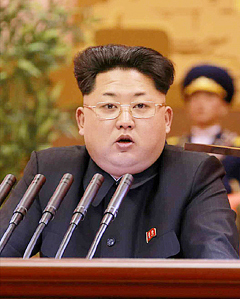 Will Kim Jong-un Live Up to His Message of Peace?